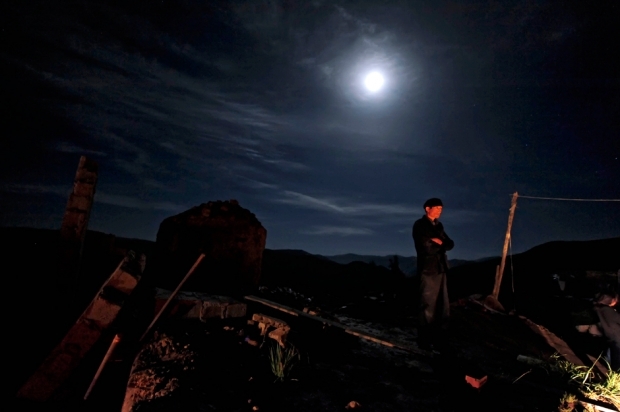 A man stands atop a pile of rubble after two earthquakes hit Dingxi in Gansu province, July 22, 2013, killing at least ninety-four people and leaving tens of thousands of survivors traumatized. Paul Krugman in a recent post (“How Much Should We Worry About a China Shock?” The New York Times, July 20, 2013) tells us NOT to worry about the impact of a slowing China on global exports, but to be worried, very worried about the indirect and unanticipated effects of a Chinese hard landing. Using the scenario of a five percentage point decline in growth rate—which I suppose means growth at 5 percent next year—Krugman warns of unpredictable, scarcely conceivable, effects on “politics and international stability.” In fact, you don’t need to stray from the realm of economics to see that the unpredictable side of a Chinese slowdown is what is most worrisome. Krugman takes strong positions on the most important issues of our day: he is sometimes wrong, sometimes right, but always full of insights and worth reading. In this case, Krugman is right, but for an uncharacteristic reason: his conclusion is one of breath-taking banality. If China crashes, it will not be the direct and predictable effect on export demand that will be most important, it will be the indirect effects. Yes, indeed. And if you needed Paul Krugman to tell you that, you haven’t been paying attention for the last, oh, seven years, since during that time period the unanticipated and indirect effects of virtually every major economic event have outweighed the direct and predictable effects. China is certainly no exception. Indeed, at least three crucial facts mean that the aftershocks of major problems in China will be extremely hard to predict. First, China has not experienced a recession in more than twenty years. Most of the economically active people in China today are young people who have never personally experienced an ordinary recession. Every other economy in the history of planet experiences occasional recessions (at least), and China is unlikely to be an exception. This means that when millions of economic actors in China adjust their expectations to encompass, say, eighteen months of economic contraction, the change in behavior will be massive and intrinsically hard to predict. Second, China has massive capacity in virtually every industrial sector. If domestic demand in China falters, businesses with excessive capacity will be in severe distress, and will seek to cut their losses by dumping goods on the global market. This creates the potential for enormous downward pressure on goods prices in many global markets, with unknown consequences. Third, nobody knows how many bankruptcies will appear in a major Chinese downturn, who will end up being implicated, or what the consequences will be for payment and collateral relations. Defaults and missed payments will ripple out through—at a minimum—the East Asian trading economy. Sudden flows of hot money out of—and perhaps into—China will destabilize financial markets in ways that are hard to predict. Indeed, one of the big lessons of the 2008 Lehman bankruptcy is that the entire global economy requires stable collateral and payments to operate. (At least we are a bit better prepared for this one than we used to be). Now, here’s where Krugman is wrong: he conflates two different problems: slowing down an economy that is overly dependent on investment, but now faces new constraints (very difficult); and unwinding a Ponzi scheme (impossible). China is not a “Ponzi bicycle” economy; it is a real economic miracle, with multiple serious and debilitating Ponzi schemes woven deeply into the fabric, especially in the financial sector. There’s no room for complacency; but caricatures don’t help much, even if they’re painted in the brightest of colors. Barry’s comments make good sense to me. I am not an economist so I will focus on his key point of the unpredictability resulting from Chinese downturn. That is most worrisome to me. The politics will be complicated, and the effect both material and psychological on the globe’s multinationals could be significant. The Party will roll over anyone or anything that gets in its way. But for the most part, the leadership runs scared of its own people’s expectations. For anybody under age 40, their baseline of economic life is a country with exponential growth that transforms people’s lives and provides bountiful opportunities. Those days are certainly gone. The people I talk to—rich, middle class, poor—share one thing in common: fear of the future. The poor that they have missed the boom. The middle class that their lifestyle is unsustainable. The rich that they can be dragged into a rigged courtroom at any time as the corruption crackdown focuses on those who were not born under a silver sickle. Many tell me they have “lost hope.” When I ask them to articulate that further, they eventually circle toward various ways of describing their fear that China will not become what I can only call a normal country. A country in which people can trust the food they eat, the air they breathe, the medical care they receive and enjoy the legal protections of citizens—not subjects—who have some say over their lives. The leaders know this, hence, “The China Dream!” Xi Jinping’s dream is that as people dream of China becoming a normal country the Party can remain the dreamweaver. How this dream can avoid becoming a nightmare as China goes through a needed downturn in order to reform the economic system will depend on the restoration of hope and trust in the Party. That won’t be easy as Chinese people today mostly seem to tolerate the Party as long as it delivers economic growth and social stability. Now to the foreigners. Before the Internet and social media, when the Party controlled the message, problems in China were only reported on and discussed publicly in terms of the government providing solutions. Now that problems can’t be hidden, they are blamed mostly on foreigners. Unrest? Corruption? Inflation? Remember those flies Deng Xiaoping said would come in once the window was opened? A fairly senior government official recently told a friend of mine that the horrific air pollution in Beijing is the fault of foreigners. He pointed out the most of the cars on the road carried foreign brand names. He didn’t mention they are manufactured in China through forced joint ventures with state companies. Multinational CEOs these days are very frustrated by China. They need the growth market, can’t wait for the shift to a consumer led economy, and dream of the next 800 million striving to join the middle class. But they also are feeling less and less welcome as more and more market barriers are erected and local companies enjoy more and more privilege. For many MNCs with big businesses in China, their focus today is on market survival as much as expansion. The current onslaught against foreign pharma in China is the largest manifestation we have seen yet of going after foreigners to demonstrate the Party is serious about fixing problems. There certainly appears to be some very serious corruption problems in the pharma business in China. But my guess is the foreign MNCs are amateurs compared to their local counterparts. In short, there is no love lost these days between foreign business and China. So how will global MNCs react to a downturn? Probably not well. Global MNCs and foreign governments usually look at China as much better than it is when times are good, and much worse that it is when times are bad. Like the Chinese citizenry, MNCs will tolerate Chinese officialdom as long as there is significant growth and stability. Investors should prepare for an overreaction by many MNCs when the Chinese economy takes its inevitable slide. CNBC, Fox Business and the rest of the cable TV cacophony will wake CEOs up in the morning with fresh catchphrases breathlessly describing Chinese crisis and calamity. I will leave it to Barry, Michael Pettis and others to describe the economic details. But behaviors driven by the political and psychological ramifications of a downturn are just as consequential and much less predictable. Krugman in my opinion has never had much of interest to say about China, or for that matter about any developing economy. His most famous foray outside the rich economies was his Foreign Affairs essay of 20 years ago, “The Myth of the Asian Miracle,” where he argued that the success of east Asian economies owed far more to factor accumulation than to efficiency gains. While this was broadly true it was also stating the obvious: that’s what developing economies do—mobilize the factors of production. Efficiency-driven growth usually comes later. The more interesting question was why east Asian countries did so much better at this task than many other developing countries. China is just the latest and biggest example of this pattern: it has grown for the past fifteen years mainly by adding physical capital, and now it needs to grow by using its capital more efficiently. That’s a difficult transition. I agree with Barry that our understanding of the risks of this transition is not aided by simplistic caricatures such as Krugman’s. For me, Barry’s first point—that most people in China have never experienced a recession—is the most interesting. It’s not entirely true—I think the 20 million or so industrial workers who got laid off in Northeast China in the great state enterprise shakeout of the late 1990s and early 2000s saw themselves as living through hard times, and some of them are still economically active. But it’s true enough, and we’ve seen a lot of evidence this year of businesses asssuming that a big government stimulus was on its way to restore growth to its former heights. The problem now for the authorities is that they have to let growth slow enough so that businesses have to start focusing on efficiency, but they need to avoid torpedoing business and consumer confidence. That’s a tricky task. China is approaching the point of “free fall,” the moment when Beijing’s leaders have lost control of the economy. The country is slowing fast. In 2010, China had at least the 10.4 percent growth claimed. Today, among other things, electricity statistics, manufacturing surveys, price indexes, and trade data indicate the country is growing in the very low single digits. Chinese leaders say they will not resort to stimulus, but they are in fact pumping extra cash into the economy through the five largest commercial banks. Moreover, this week’s announcement of new rail construction is, of course, stimulus. Yet state cash is not having the desired effect: these days Beijing gets only 17 cents of output for every dollar of stimulus, down from 83 cents of output in 2007. This means Beijing technocrats are quickly losing the ability to keep the economy going as they essentially have no other tools that can ensure GDP creation. Once this becomes apparent, the Chinese—and foreigners—will lose confidence. Most analysts expect China to slow gracefully, but the rapid deterioration of growth, which is bound to accelerate, suggests the adjustment will be unexpected, sudden, and catastrophic. So what does this mean for us? First, China’s stockpile of Treasuries in the middle of 2011 was larger than it is today, which means we can finance our deficits without the Chinese. Second, China is not an engine of global growth. To be such an engine, a country has to buy the products of other countries to stimulate growth elsewhere. Beijing, through predatory policies—intellectual property theft, hidden manufacturing subsidies, and arbitrary administrative actions, among others—has been taking growth from us. Third, China needs us more than we need China. Last year, China’s merchandise trade surplus against the U.S.—a record $315.1 billion—was 136.3 percent of its overall merchandise trade surplus. The Chinese, unfortunately for them, cannot replace the American market, but we can buy goods elsewhere. Fourth, the central government for more than a half decade has been undermining foreign businesses in China, trying through various means to close off opportunities. Foreign companies were never going to have much of a long-term future in the People’s Republic. As soon as a foreign business gets market share, Beijing tries to cut it down to size. Ask Google, for instance. In March, China turned on its propaganda machine against Apple. This month, Chinese regulators are using discriminatory prosecutions to go after international milk, packaging, and pharmaceutical companies. Yes, there will undoubtedly be panic when China fails. But when the dust settles, we will be okay, especially if we understand our relationship with that country.